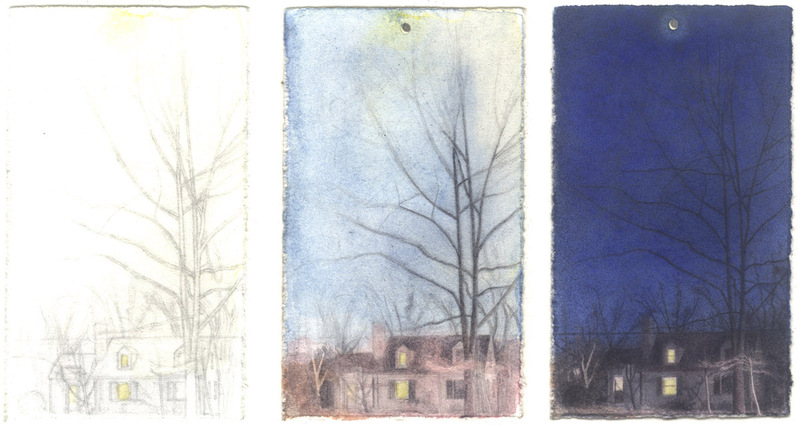 Charles Ritchie, three sequential states of House and Moon [work in progress], 2009, watercolor and graphite on Fabriano paper, 3 1/2 x 1 1/4″. States were imaged (left to right): 15 January, 17 January, 3 February. Each November the dense foliage above our old neighborhood drops to reveal the celestial dome; as a result I’m much more likely to be in tune with the heavens in winter months. Several weeks ago I saw a waning moon hanging in twilight blue-black sky and since that moment I’ve been rolling that image around in my head, especially as I work at my studio window these early mornings. As is often the case, the memory became so persistent I began a drawing of the subject, responding not only to the image, but a casual event; as I dug through a pile of drawing paper, a very tiny piece appeared. The sheet seemed like it was made for a tiny moon in a vertical format landscape. Three stages of the drawing, which is still in progress, can be seen above. It’s been said that Michelangelo studied the quarried marble, trying to see the figure to be carved in the material. I can’t say that my discovery of the right sheet of paper for this moon image came about the same way Michelangelo recognized the stone for one of his sculptures; but I am intrigued by such mental leaps that associate image with material. I can’t say that I understand it, but at the same time, I think that Michelangelo’s recognition of possibilities inherent in a particular stone was essential to the creation of the David; or in my own modest case, the association I made between the image I was carrying in my head with a particular size and format piece of paper. For me, the reaction feels subconscious; I instantaneously know I’ve found a solution before I’ve thought about it consciously. As I continued to muse on that waning moon, making sketches in my journal and sustaining a variety of drawings, I looked at my astronomical calendar and realized that my early morning drawing sessions were soon going to be joined by the red star Antares, (see my previous online journal entry, Antares and an Old Moon); to me the star’s presence signals the impending movement towards spring. As I waited for the moon to return to the same phase I had recorded in earlier sketches, Antares joined my morning sessions and I suddenly I realized that Antares and the moon were going to cross paths. The moon occulted Antares on the 21st of January. It surprised and delighted me that these subjects of my interest suddenly came together. Somehow the event made me think more strongly than ever that alignment of certain forces and our alertness to those forces is the engine for intuition. 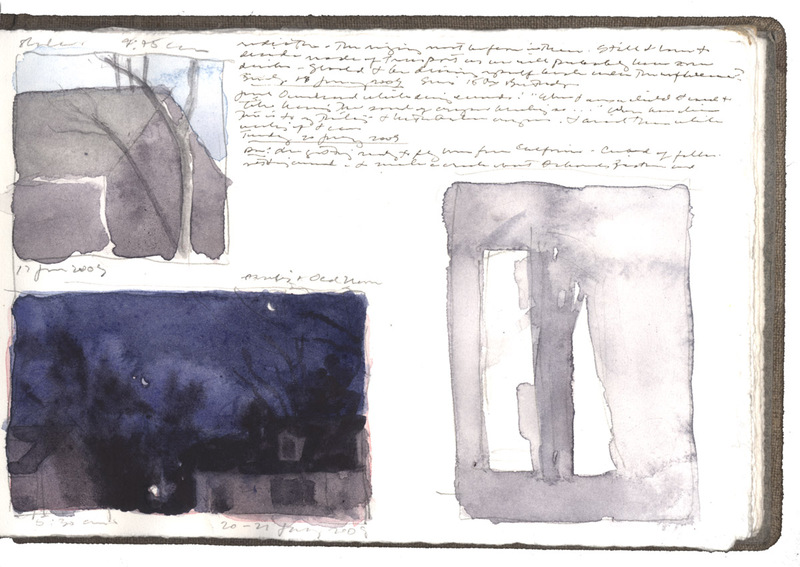 Charles Ritchie, page from Book 131, (lower left) sketch of Waning Moon and Antares seen on consecutive days, 20 and 21 January 2009, at 5:30 am, watercolor and graphite on Arches paper, 4 x 6″. A few days ago I took a walk along a familiar park trail, stopping as I often do on a bridge over the creek. Looking down into the water, I saw the reflection of a great sycamore tree hanging over the creek, its uppermost branches, inverted in the water, were bathed in the red light of sunset. At first the image seemed like a strange déjà vu, echoing how my day had been spent, drawing the branches of a large tree in one of my ongoing projects. But then I started thinking about what this image might mean to my work, what trajectory it might take, what intersection might be ahead, and how my intuition might one day connect it to something at just the right moment.